In order to tackle this issue Europa Distribution, in partnership with the San Sebastián International Film Festival, organized an Open Panel that took place on September 24 at the San Telmo Museum, to invite representatives of different parts of the value chain to discuss about the existing models and new ideas that can help films to circulate after the theatrical window. 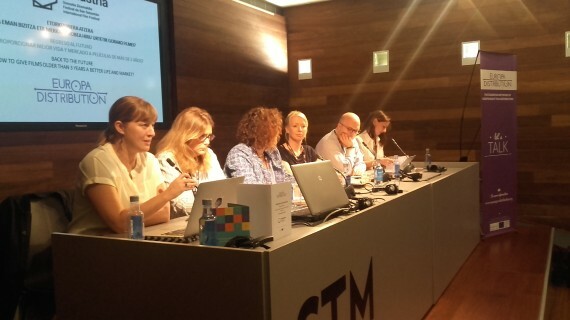 The need to create stronger collaborations across the value chain was stressed several times by the speakers, and both Joséphine Létang (La Toile) and Anke Van Diejen(Picl) addressed this topic specifically, discussing local models of collaborations between VoD platforms and cinema theatres. Joséphine Létang, who founded the French TVoD platform La Toile in 2017, explained that she started with a simple reasoning: “People might not know what a VoD platform is but they know – and trust – the cinema theatre around the corner.” La Toile started with 5 cinema theatres, each curating its own page on the platform, and has now 40 cinemas participating on a revenue share model. Cinemas promote the platform getting a share of the transactions. La Toile chooses each month catalogue films thematically related to new releases screened by the partner cinemas, building up a catalogue of films that remain available on the platform also after the films are no longer promoted on the home pages. Europa Distribution members continued the discussion about the topic during two closed workshop sessions where distributors Barbara Dias (Curzon Artificial Eye), Eduardo Escudero (A Contracorriente, ES), Anna Harding (Folkets Bio, SE), Karoline Mennecken (Prokino, DE), Fredrik Scholze (Arthaus, NO) and Adriënne Van den Berg (Cinemien, NL) also shared their experience regarding the exploitation of catalogue titles through the analysis of concrete examples and case studies. From both the Panel and the workshop sessions, it clearly emerged that on one side the VoD market is not travelling everywhere at the same speed, and that in most territories the gap left open from TV and DVD sales drop will not be covered in the immediate future, but on the other it seemed also clear there are different models that are emerging and that cross-sectors collaboration is one of the key elements for successfully travelling (back) to the future.